We who seek the Lord and are trying to live daily for the Lord sometimes are looking to understand and know where we are in our walk. 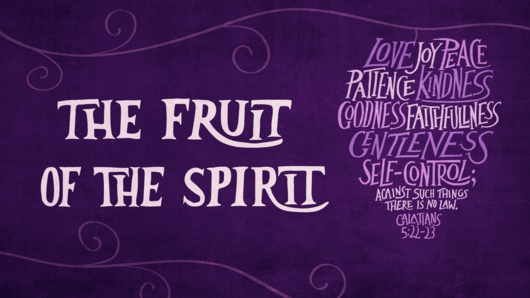 Where we are in our walk with Christ is evidenced by the “Fruits” of the Holy Spirit we produce in our daily life. And our walk in Christ should take us down the path to adding more Fruits in our Life. The first Fruit is Love …that being the Love of God. God’s Love is unconditional, it is all-encompassing, and it is saving. It comes when we receive Christ Jesus as our Lord and Savior. Once God’s Love is in our Hearts, we are overcome with Joy. We are Happy and Joyful about our relationship with Christ Jesus. We have a Joyous outlook daily no matter what that day holds. That Joy leads to Peace. Peace because we know the Lord is in control. The Lord is watching over us, guiding and keeping us. Peace because I don’t have to worry about what tomorrow holds. Peace gives us Longsuffering, or what we today call Patience. It is the Patience to wait on the Lord and His timing. Patience allows us to wait on the Lord to prepare us for the next move. Patience gives us the strength to bear thru any situation or circumstance because the Lord is on our side. Patience is waiting for God to clear the path before us. And Patience is the ability to hold on to the Word of God. Now you’ll note that the first three fruits deal with us internally. Now comes the fruits which deal with our active interaction with others. Kindness … In His Kindness, we can be compassionate with everyone we come across. We can deal with people in their situation. Faithfulness … Follow thru. Faithfulness is a Commitment to the Work of the Lord. And the work is His Holy Spirit working in us and thru us to serve God’s purpose to build up His people and His Kingdom. Gentleness … Humble and without boasting. He is doing God’s Will because it’s God’s Will and using the Word of God to comfort and edify His people without clubbing them over the head with it. Self-control … Self-Control is actually Spiritual Control. Meaning we do not yield to the reaction and the tendencies of our flesh. However, instead of submitting to the direction of His Holy Spirit in all things. Thoughts, words, and actions. John 10:10b tells us “I am come that they might have life, and that they might have it more abundantly.” Seek the Fruits of the Spirit and God will Bless you will the abundance of Life.